Welcome to the Wednesday Hodgepodge...if you're visiting today from the A-Z blog challenge you'll find today's letter in question #8. 1. Would you rather talk to everyone at a crowded party for a short time or have a significant conversation with two people? I like the idea of talking to a lot of people but I think in reality I usually end up having conversations with just a few. Define significant. 2. What objects do you remember from your parent's living room? The living room was sort of off limits to us kids so we didn't spend a lot of time in there unless we had company or there was a special occasion. It wasn't that we were forbidden from being in there but the room was always neat as a pin and full of nice things so we didn't hang out in there on any sort of regular basis. One thing that stands out would be the end tables which were Japanese and shaped like a cube. When my parents would go out my older sister and brother would turn the stereo up to LOUD and my younger sister and I would each stand on an end table and play the part of go-go dancer. Hi Mom! Did you know this before you read my blog today? 3. Do you hog the bed, steal the covers, snore? I am only guilty of one of these behaviors....if you're my same age or close to it then you know I'm not stealing covers because hello-I'm always hot. And I think my hubs is more of a bed hog than me. He likes to be close when we're sleeping but did you read what I just said about the joys of mid-life? That just leaves snoring. So I guess that answers that. 4. Speaking of Easter dinner...what is your favorite way to cook/eat lamb? Or does just the thought of that make you squeamish? If you're not cooking lamb what will be your entree du jour on Easter Sunday? I love lamb. We ate a lot more lamb when we lived in the UK because it was so available and not as expensive as what I have to pay here. I love rack of lamb and if that's on the menu in a restaurant I'll order it. I've never actually cooked it myself. My favorite lamb dish to prepare at home would be grilled lamb chops. I usually brush them with a little olive oil and add some garlic and rosemary. Yum! We also like to have the butcher butterfly a leg of lamb and then we grill that with similar seasonings. I am hoping to serve that for Easter dinner this year. Most years we have a baked ham which is also good. 5. Let's throw some politics into this week's mix...oooooohh....Do you know the whereabouts of your birth certificate and when was the last time you had to produce it to prove you're you? I know precisely where my birth certificate is and I've had it out as recently as a month ago. Hubs company did an audit of their insurance program and all dependents had to prove they were legal dependents. This involved handing over my birth certificate along with our marriage certificate. I know many companies are doing this now. We also needed our birth certificate to obtain visas and work permits in the UK so we've actually had ours out quite a bit in recent years. 6. As a child, how did people describe you? And if you're my mother you might answer talkative and stubborn. 7. What do you complain about the most? I am not a complainer by nature, at least I try really hard not to be. If I have to give an answer I'd say it's a toss up between the way my body is rebelling at growing older and the yahoos in Washington DC. I'm once again using today's random space for my A-Z blurb. If you want to read all my A-Z posts to date (and why wouldn't you?) then go here. K is for Kew Gardens. Situated in southwest London these amazing gardens are over 250 years old and definitely worth a visit if you're spending time in the UK. I've been many times and there is always something to see and enjoy but, today I'm going to share just a few pictures from a fabulous exhibit I saw at Kew way back in October of 2005. It wasn't called that but it could have been. 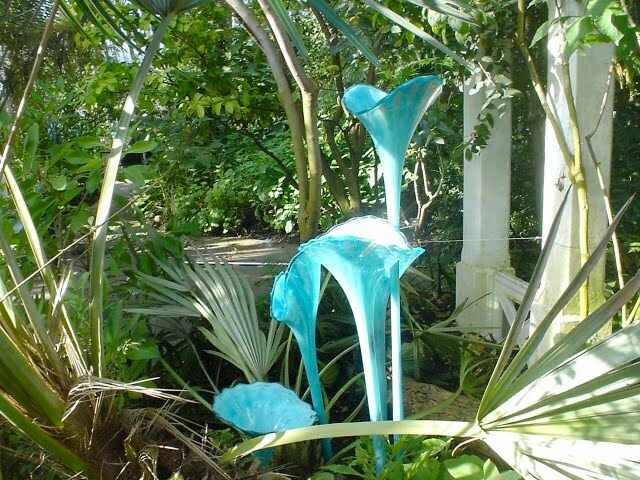 The famed glass sculptor, Dale Chihuly, created a series of spectacular designs which were then spread around the 300 acres of gardens as well as inside some of the glass houses for which Kew is known. This was the first time I'd ever seen any of his work up close and I was an instant fan. Since then I've seen more pieces in several famous hotels and museums. Coincidentally my husband took this next picture just a couple of weeks ago at the Atlantis Palm Hotel in Dubai. His work is easily recognizable and absolutely beautiful, especially when viewed up close. Chihuly is a native of Washington State. If you have a chance to see some of his creations, definitely go. 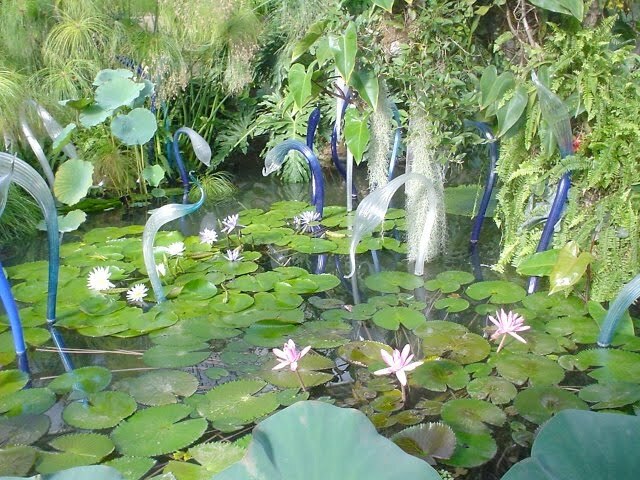 This ended up being more about Chihuly than Kew but rest assured, any day spent exploring Kew gardens is a good day. This special exhibit just made our visit doubly nice. Ok, I need to add your number 7s to my list of complaints too. Love those sculptors! Oh my! The colors are just beautiful. I don't like what my body is doing either. Glad I'm not alone there. 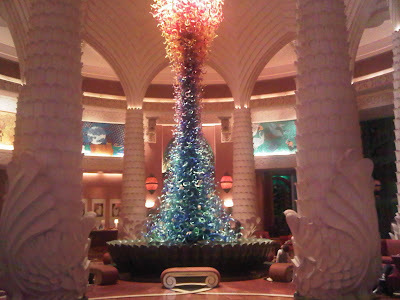 Love the glass sculptures. Those are amazing. Yes, I guess I probably complain about the yahoos in DC as well. Last night at the Space Shuttle celebration, before I knew what was happening Prince went on a rant about Obama and the lack of space program support to my mom's former boss. She said, "Sounds like this is discussed at home quite a bit." I think Chihuly did the stairwell art at the Indy Children's Museum...Very Cool! Thanks for the lamb suggestions. I would rather have a few good conversations also....I steal covers and maybe snort here and there.No lamb for me...we do Ham on Easter. Last time for birth certificate was for my drivers license when we moved here. I laughed so hard thinking about you and your sister go go dancing....we use to get on top of piano and pretend to be Cher! Have a great Wednesday! I enjoy reading your list of A-Z blogs-have used some in world geog. class-just pics!!! Thanks!!! Forgot about hot flashes--yep one time turned the temp.down to 59 in our bedroom and husband was freezing, but I was just fine!!! 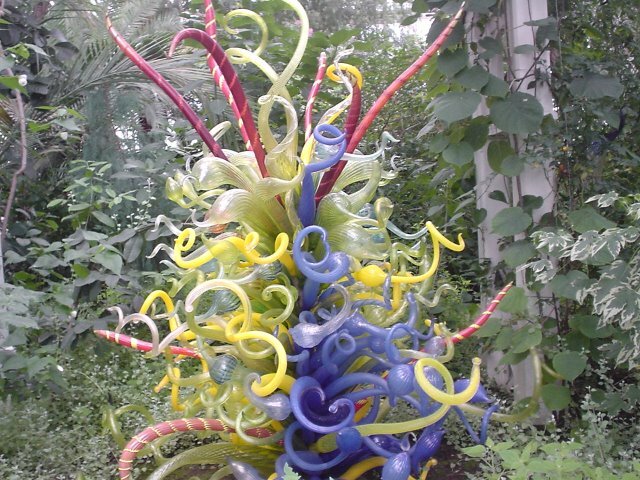 I saw a Chihuly exhibit at the Missouri Botanical Gardens in St. Louis a year years back. Amazing! I must be the only 50+ year old who was spared the hot flashes. Too bad as I'm always so cold that I would have liked to have had a little extra warmth. ha! Great answers and I love the beautiful photos! #8 is KEWL...as my teenage daughter has been known to spell cool :D Those glass sculptures are amazing! The garden is amazing! Hope you are loving the A-Z Challenge as much as I am. Wow, the glass sculptures in the Kew gardens are amazing. That is so funny about the end tables. I seldom have covers on me. I would love to see those gardens, absolutely beautiful. Thanks for hosting and enjoy the rest of your week. Oh - KAY....clever multi tasking. #8 is great! I love your answers, especially #2, and the photos are spectacular! Your go-go answer reminded me of when I was doing gymnastic flips in my parents living room while they were trying to sleep. Too funny! 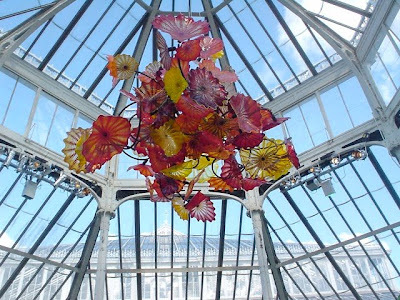 The photos of Dale Chihuly's work are amazing. I have seen his exhibits before, but they never cease to astound me. I could not pick a favorite--I love them all. I have never been to Kew Gardens and I LOVE botanical gardens. 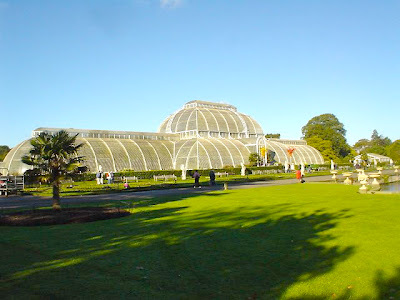 I've been to London a number of times, but not to Kew. 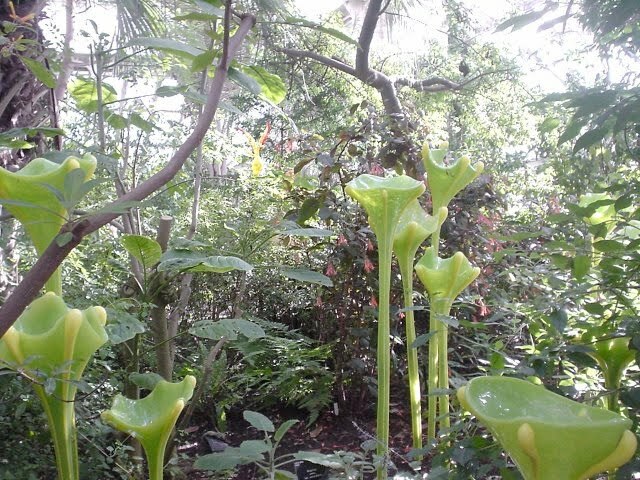 Guess I need another reason to return"
I love Kew Gardens! It's so gorgeous. Those glass sculptures are crazy. I agree with you on church and the way folks dress. I continue to dress up for church and I imagine I'll go to my grave doing so. I truly do believe it helps to set the tone for worship when we are a little on the dressy side and of course, neat. I'm also enjoying your A-Z entries. Truly, you have been everywhere. :o) Happy Wednesday! I am not a fan of lamb...tried it once before and, to me, it had a very strong gamey taste; I'm more of a ham kind of gal. Your pictures are gorgeous...would love to visit there one day! I think that if moms knew about all of the things their children did, there would be a lot of heart-attack related deaths! Your story was a hoot! leg of lamb/grilled: me, too! my body is rebelling at growing older: mine, too! 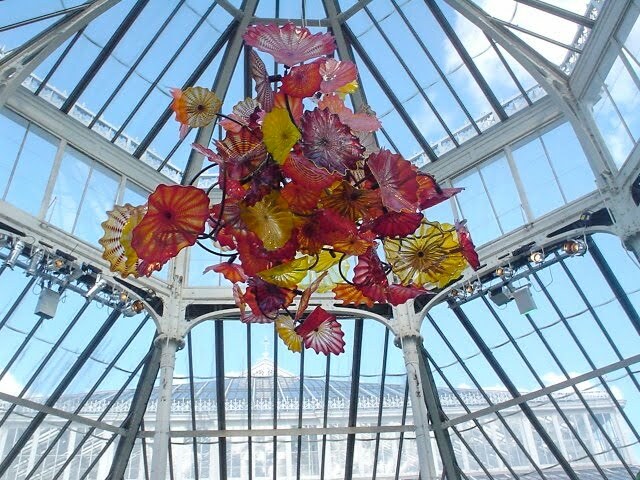 Kew Gardens: gorgeous; glass sculptor, Dale Chihuly: me, too!! hahahah...he did an exhibit here in ATL too and I enjoyed it tremendously...my MIL went to seattle and met him and see his studio with her travel club.